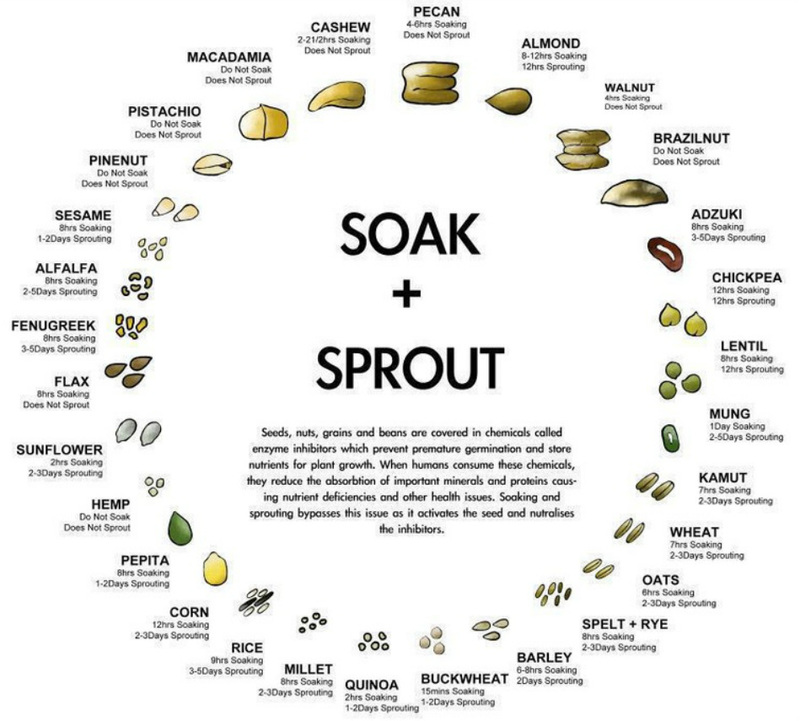 Why do we Need to Soak and/or Sprout Nuts, Seeds and Grains? In a nutshell (pun intended), there are two reasons: phytic acid and enzyme inhibitors. for germination and growth. When that seed is consumed, phytic acid impairs mineral absorption. There are also enzyme inhibitors within these seeds that impair the digestion of proteins. which leads to greater nutritional value and less digestive discomfort. with 2 tsp sea salt and filtered water. ie not roasted or salted. or a piece of screening cut to fit inside the ring. Soak for the recommended amount of time. and continue to rinse and drain at least every 12 hours until you are happy with them. (a dishdrainer works well), so that it can drain effectively. Are you SOAKING and SPROUTING your Grains, Nuts and Seeds? 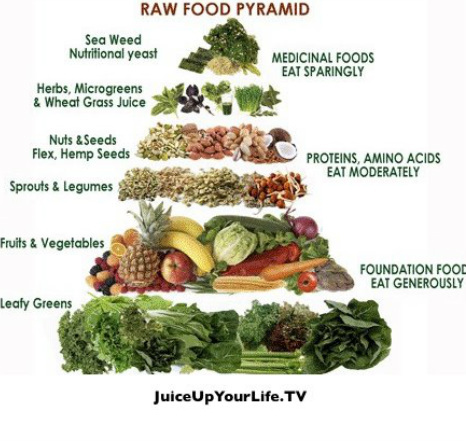 a wealth of beneficial vitamins and nutrients to feed the human body and soul. they need to be soaked anddehydrated or sprouted. and promotes the growth of healthy enzymes vital for healthy digestion. Nuts, grains and seeds are one of the ultimate gifts from God. that protect the plant from germination until the ideal conditions are present. It is not until they get wet and there is sufficient moisture that they germinate. This natural protective phenomenon is a wonderful thing for the survival of the grains, nuts and seeds. it can really wreak havoc in our digestive systems if consumed in vast amounts. Have you ever noticed after eating a lot of grains, nuts or seeds that you have a horrible stomach ache? if we get too greedy without soaking them! and amylase, which digests carbohydrates. are not such happy chappies inside the human body. It only makes sense I suppose. What do warriors do? They wage war! Well, they wage a war of sorts. and interfere with the chemical order of our natural enzymic activity. Another problematic component contained in grains is the presence of phytates. There are a lot of anti-nutrients present in foods that inhibit the absorption of nutrients. I will just focus on phytic acid, which is ever present in grains. Nuts and seeds do not generally contain phytates. But grains are riddled with them. Health and nutrition panels are always preaching the virtues of whole grains. But it is in the outer layer or the bran of the grain that the phytic acid is found. I am not for one minute suggesting that we all switch to the milled and refined grains that have the outer part removed but also every other good part! which makes it a very undesirable little pain if not properly eradicated. That is where soaking comes to the rescue! increases the nutritional content of Vitamins such as Vitamin A, C and, in particular B Vitamins. that then neutralizes the enzyme inhibitors making them more digestible and easily utilised. which, in turn, neutralizes the phytic acid in the grains that put such a strain on the digestive system. I remember the first time I soaked brown rice for 36 hours. I still found it difficult to believe that something so smelly was so good for me! I have embraced the virtues of live fermented foods. By lacto-fermenting foods we are boosting their nutritional profile which enhances the digestive process and the growth of friendly bacteria. Nuts, seeds and whole grains are no different. They are much easier to digest, and their nutrients are more potent readily available, and they taste a lot bitter if they are first soaked in warm water for varying degrees of time. If you are saving the nuts and seeds for later use you will need to dehydrate or sprout and dry them. However, if you are using them in raw smoothies or vegan soups you can just soak and rinse. I do it all the time. I just soak, rinse, blend and chow. With grains, I really only eat millet, quinoa, amaranth and brown rice these days. I always soak, rinse, cook and serve. soaking whole grains really softens them up and makes them a lot more light and fluffy. A lot of people who have told me they don’t like the gritty taste and texture of brown rice are amazed with the difference soaking makes to this grain. Brown rice more closely resembles white fluffy rice once soaked for 24-48 hours! Give it a go, You will be pleasantly surprised. click to read "LET'S GET SICK IN 10 EASY STEPS!" There is more info re PH balance on weebly.com/cancer. page. Pack the veggies and celery juice along with the starter culture, such as kefir grains, whey, or commercial starter powder all of which can be used for vegetables- into a 32 ounce wide-mouthed canning jar. Don't eat out of the jar, as organisms from your mouth can be introduced into the jar. So, always use a clean spoon to take out what you're going to eat, then, making sure the remaining veggies are covered with the brine solution, recap the jar. While culturing your own foods is rather easy, if you don't want to ferment your own, but appreciate the value of them, Caroline has a company that sells fermented vegetables. You can find her products on www.CulturedVegetables.net or www.CulturedNutrition.com. Kefir ‘grains’ are also very beneficial microorganisims. Kefir is, excellent for the GAPS diet; all the probiotics it contains are excellent for gut healing. Like Kombucha, kefir ‘grains’ are colonies of beneficial microorganisims. B vitamins, and Tryptophan, the amino acid in turkey. It is less thick than yogurt, and tastes similar. Rice miso is even gentler/wonderful in soups, burgers, casseroles as the stock flavour. full of nutrient dense foods like meat, eggs, fats, vegetables, bone broths, and organ meats. Compared to the standard American diet (SAD), this can be quite a shock for the home cook! But there are many GAPS recipes that are tasty and easy to make. For monthly meal plans full of recipes for the GAPS diet, check out my Grain Free Meal Plans. What Can I Eat Now, 30 Days on the GAPS Diet. The process of lactic acid fermentation used to transform salt and cabbage into sauerkraut increases vitamins, particularly vitamin C and B vitamins, and food enzymes. Moreover, homemade sauerkraut is also extraordinarily rich in beneficial bacteria – friendly microorganisms which help to colonize the gut, train the immune system and manufacture vitamins in the digestive tract. In winter, when colds and flus make their rounds, homemade fermented foods which provide plenty of vitamins, food enzymes and beneficial bacteria coupled with fermented cod liver oil (see sources). When the cabbage has become limp and released its juice, transfer it to a sauerkraut crock or vegetable fermenter (see sources). Pack the salted cabbage into the crock or fermenter as tightly as you can, eliminating air bubbles. Continue packing the cabbage into the container until it is completely submerged by liquid. Cover loosely and allow it to sit at room temperature, undisturbed, for at least seven days and up to three or four weeks, testing the sauerkraut every few days until it is done to your liking. Transfer to the refrigerator or other cold storage where it should keep for at least six months. NOTES: If scum appears floating in the brine of your homemade sauerkraut, simply spoon it off. You won’t be able to remove it all, but spoon of what you can and don’t worry about. The real key to preparing homemade sauerkraut, and any fermented food, is that the solid materials rest below the liquid. Fermentation is an anaerobic process and to expose your ferments to air increases the likelihood that they’ll become contaminated by stray microbes, yeasts and molds. Foods that disrupt the biological terrain diminish the negative charge of the red blood cells. these foods accelerate the process of rotting, or the composting of Western civilization. After high-sugar foods, grains constitute the next major class of yeast/fungi/mold-stimulating foods. I need to point out the effect of grain on our society and our health. vegetables, fruits, nuts, and seeds. The only natural grain eaters are birds. To eat grains, humans usually have to cook them (some grains, however, can be sprouted). maximum amount of calories with the minimum amount of nutrients. As a psychiatrist and holistic physician, I see many people with eating disorders. Many have problems with starches, especially the white flour, white-sugar starches that we call pastries. It seems that most people do not binge on vegetables, but they do binge on starches. Starchy foods are the number-one choice to "calm and comfort." One name for this addiction is "starchaholic." from a sensitive, tuned-in person to one who is numb, from energetic (which may happen initially for a few minutes to one half-hour or an hour) to lethargic. These symptoms are very common. which creates a tremendous drive to have that piece of cake or pizza in order to feel better. A high percentage of my patients have grain allergies and get much better when they stop eating grains. but can have an effect on the mental state as well. of mental and neurological disorders. Some research has found that gluten contains fifteen different opioid sequences (morphine-like molecules). 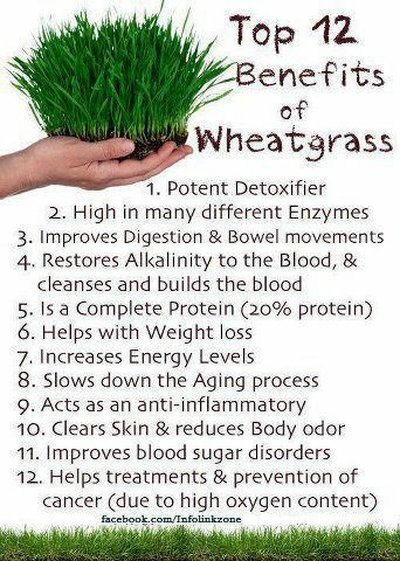 These can add to the addictiveness and neurotoxic effect of the grains. as well as to some learning disorders and to schizophrenic reactions in some people.